My White Elephant gift from a Christmas party last night. My first choice ended up being lottery tickets which as per the rules may be 'stolen' twice before they were out of 'play'. The additional potential gift of lottery money was too good to let sit so, they didn't stay long in my hands. The person whose gift is 'stolen' gets to choose a new gift. 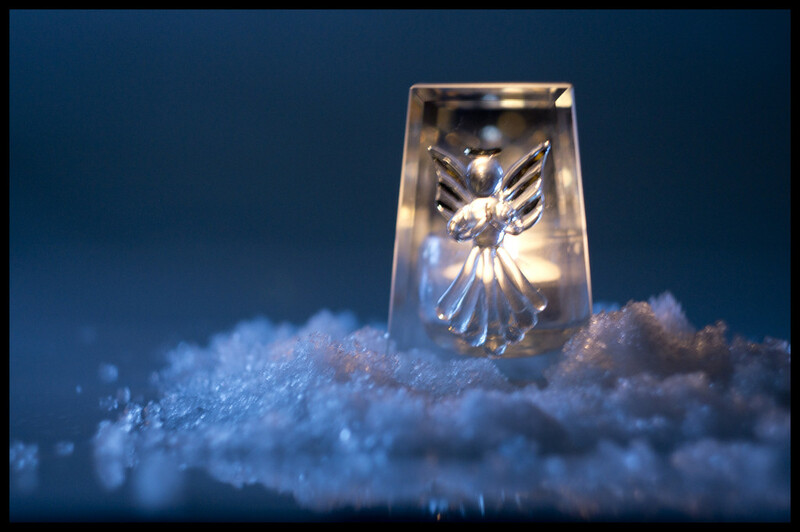 This little votive angel was my 2nd gift. I was very happy with it. The season does bring out the fun and best in all, at least at our little Thrift store crowd. I also used my new Helios 2.0 lens that was on Ebay. I do like the gentle blur in the snow that I brought inside from my backyard. My dog tried to grab the snow that I was removing from her play area but we came to an agreement, I tossed a pine cone and she happily bounded off. Tags snow, angel, votive, helios lens, distract the pup"
This is so beautiful. I'm off to Google Helios lenses! Might I want one??? I love the lighting. Glad you got to keep this one. @30pics4jackiesdiamond They are so cool, and inexpensive but I did order from a seller in Ukraine so it took awhile to get here. Manual focusing but I put my peaking level on high so that helps fairly well. @jernst1779 Thank you so much. @tstb13 Riley is rather protective of 'her' snow. We need more. @onewing Me too, I immediately saw the photos that I could get so I got protective of it. @blueberry1222 Thank you, we need more snow to really feel like Christmas. @fbailey I am glad that she didn't eat the cone. It was a bit cold (about 20F) and we had just gotten back from our 1st walk of the day. I like everything about the photo and your story, except the fact that you have snow in your backyard already. Hopefully, you will have some Christmas Day, as well. Have a happy holiday. Have not a white Christmas yes being in this part of the world. Lovely gift. This is very creative Joy and I love the backstory... and I envy you that lens - it takes me back 52 years to when I had a Zenit and did my own B&W developing and enlarging. @mbrutus Thank you so much. Snow comes and goes around here. There is some forecast for Christmas Day so I am hopeful. Being at 7000ft we do get our share of snow- Riley will be in piggy heaven. @yaorenliu I admit that I love and hate snow. The quiet that snow brings is wonderful but then the cleaning off of things. We humans are never grateful enough are we? @jo38 Thank you so kindly for the fav. The owner of the store told me it was she who put this lovely votive in the white elephant. I showed her this image and told her how wonderful of a gift it was.